At the Performance Data Caching step of the wizard, choose a directory where the performance cache must be located. Performance cache is space on disk to which Veeam ONE stores real-time performance data, as this data is collected. Performance data stored in cache is used for Veeam ONE Monitor dashboards and views. Disk-based performance cache allows significantly decrease RAM utilization on the machine that runs the Veeam ONE Server component. By default, the performance cache is stored to the C:\PerfCache folder. To store the cache to a different folder, click Browse next to the Performance cache field and specify a path to the new folder. Make sure that the disk where the performance cache is located can quickly complete read and write requests. Do not locate the cache remotely in networks with high latency values. For large monitoring environments, place the performance cache on an SSD local to the machine where the Veeam ONE Server component runs. For small and medium monitoring environments, a HDD is normally enough. Length of the performance cache folder path must not exceed the Windows Max Path Limitation value. For details, see https://msdn.microsoft.com/ru-ru/library/windows/desktop/aa365247(v=vs.85).aspx#maxpath. Make sure there is enough disk space for performance cache. The cache is cleared on an hourly basis, as new data is collected; however, in large monitoring environments it can take significant disk space. For example, in the Advanced Scalability Deployment mode, during peak loads, the cache can take up to 6 GB disk space for each 1000 VMs. 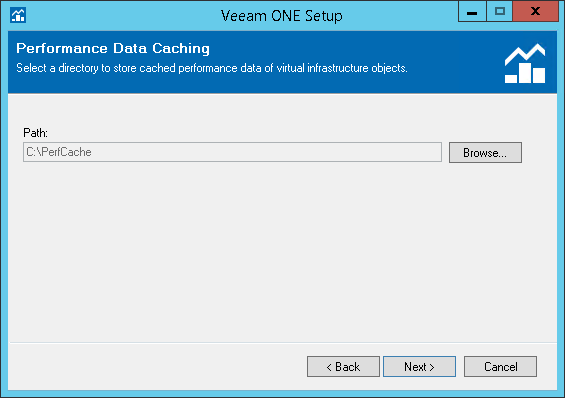 After installation, you can change the performance cache folder in the Veeam ONE Settings utility. For details, see Monitor Settings.